Registering a tool in the @ELIXIREurope regisry using XML, XSLT, JSON and curl. My notebook. The Elixir Registry / pmid:26538599 "A portal to bioinformatics resources world-wide. With community support, the registry can become a standard for dissemination of information about bioinformatics resources: we welcome everyone to join us in this common endeavour. The registry is freely available at https://bio.tools." In this post, I will describe how I've used the bio.tools API to register some tools from jvarkit. using curl, the 'bio.tools' service returns a authentication token. Creating a JSON describing the tool. 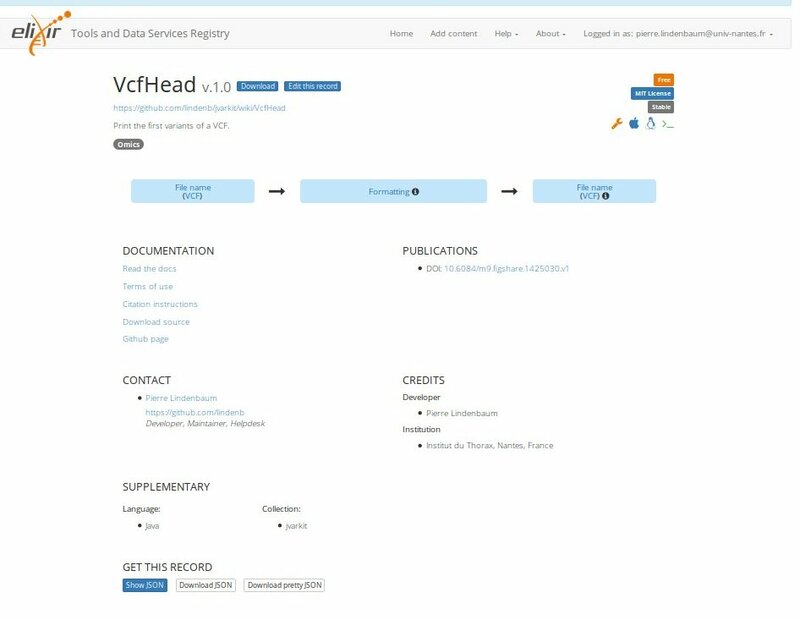 For VcfHead the XML descriptor is available here: https://github.com/lindenb/jvarkit/blob/master/src/main/java/com/github/lindenb/jvarkit/tools/misc/VcfHead.xml. Using a first XSLT stylesheet https://github.com/lindenb/jvarkit/blob/master/src/main/resources/xsl/jsonxelixir.xsl, 'VcfHead.xml' is firstly converted to the 'infamous' JSONx (JSON+XML) format . Using another XSLT stylesheet jsonx2json.xsl, the JSONx is converted to a JSON file. "Institut du Thorax, Nantes, France"
VCfhead is now visible from the Elixir Registry at https://bio.tools/tool/univ-nantes.fr/VcfHead/1.0.